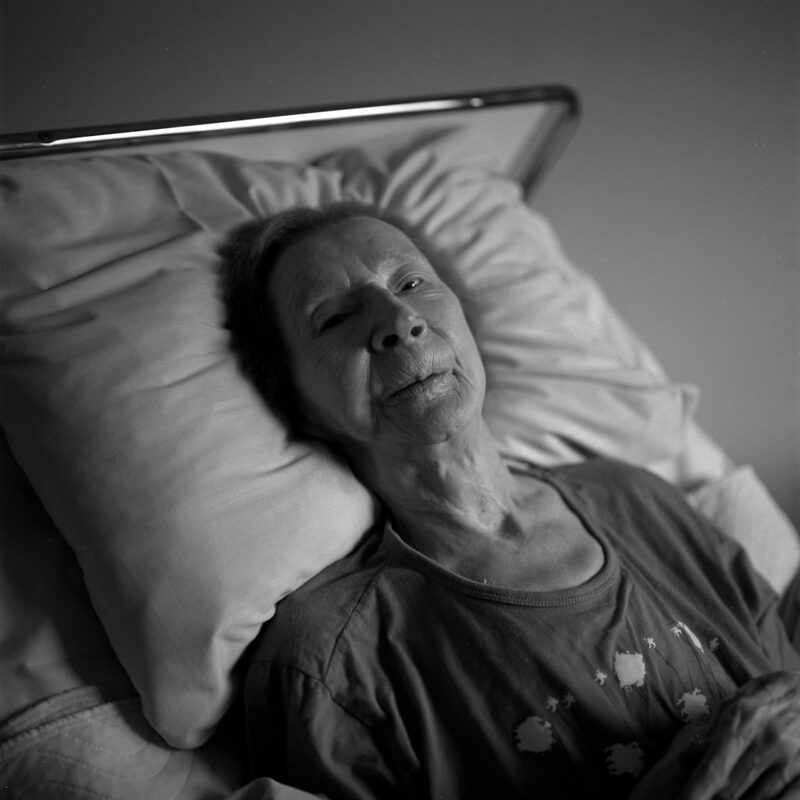 I was awarded The Mylio Grant through The Luminous Endowment for Photographers in 2015 for a research project about my grandmother titled, Elsa Johanna. 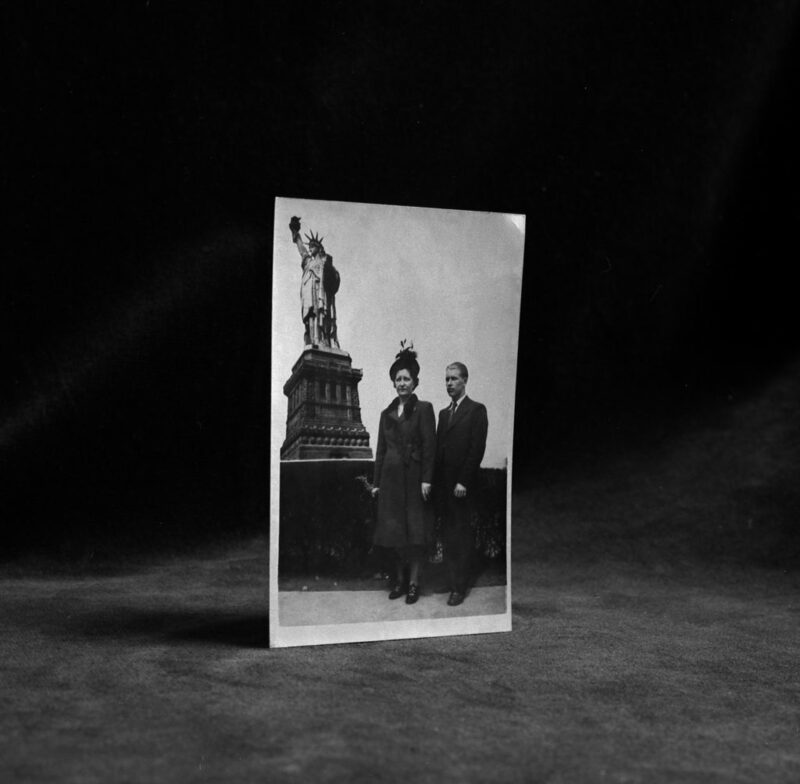 Elsa emigrated from Finland in 1925 through Ellis Island, living her life as a domestic worker in New York City. She gave birth to my father out of wedlock, never revealing whom his father was. After Elsa died I inherited her diary. It is written entirely in Finnish and spans the years 1938 through 1942. I had no means of translating it, so it stayed for quite some time in my possession. As a widow raising eight children, I had my own obstacles to overcome. It wasn’t until 2006 when I was attending graduate school at the University of Houston that one of my professors referred me to a colleague in Helsinki. I sent a very small section of the diary to her for translation. It was heartbreaking to read. Elsa was battling tuberculosis and at one point a fractured leg. She was an immigrant, and the doctors at Riverside Hospital and various clinics treated her poorly. Most importantly, she was separated from Michael, her only son. In 2012 the Savikko family contacted me on an ancestry site, suggesting we were related. I discovered that my grandmother was actually the youngest of eleven children. This seemed very odd. My grandmother spoke briefly of only one brother and a sister. Very little was spoken of her life in Finland, or of any existing family there. Amazingly enough, none of these newly discovered relatives were aware of the fact that “American Elsa” had given birth to a son, or that my brother and I even existed. The breaking news of an extended family in Finland, along with Elsa’s personal diary and the mystery of my grandfather, all led to a curious desire to find out exactly who my grandmother was. 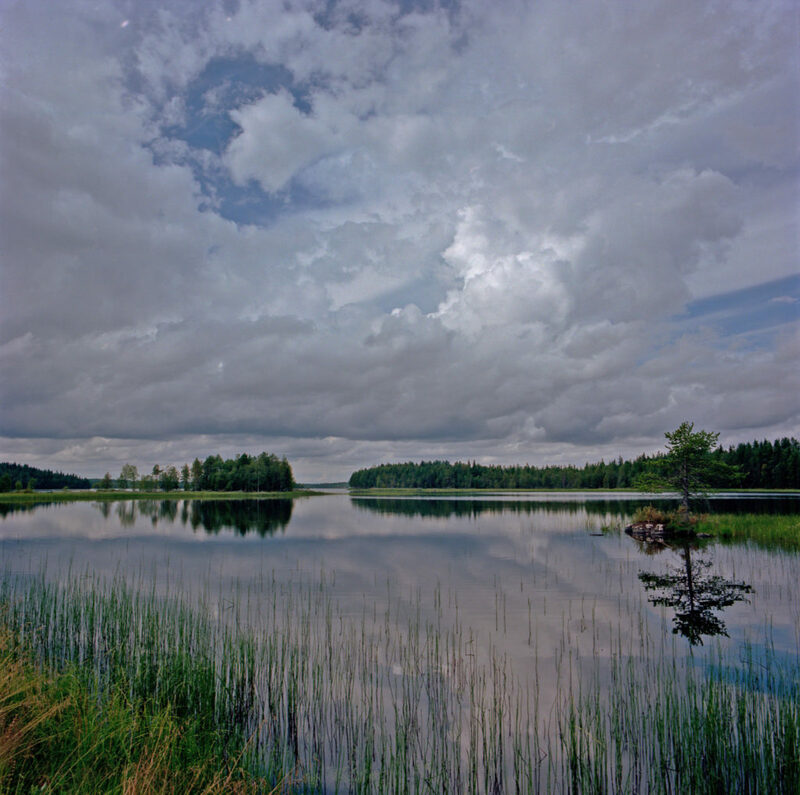 The Mylio Grant enabled me to begin the journey and visit Finland for the first time. I was able to purchase a plane ticket and have some funding for travel expenses. I stayed with members of my new family and worked with Sari Savikko, a cousin who helped enormously with researching before I arrived. 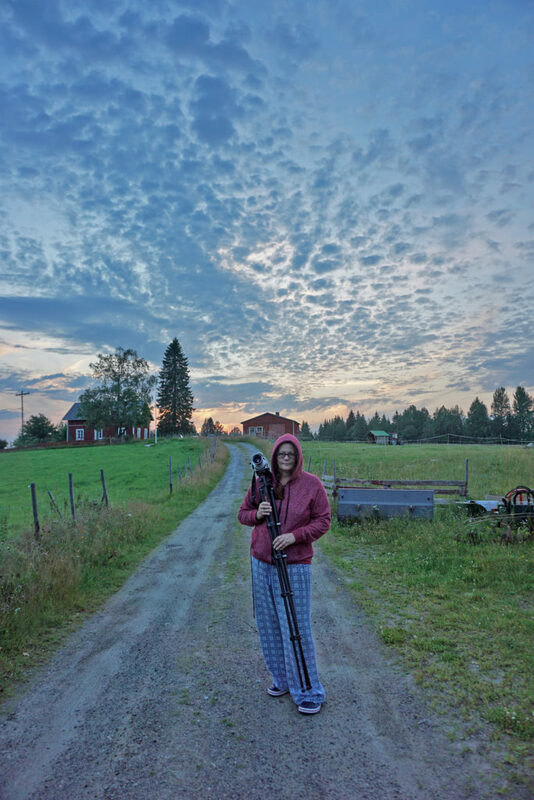 After a huge celebration and gathering of family members at cousin Marja’s house in Porvoo, Sari and I started the journey along with my daughter, Mana who came to assist in digitally documenting the story. We visited Elsa’s schoolhouse and her hometowns of Nilsia and Tuusniemi. 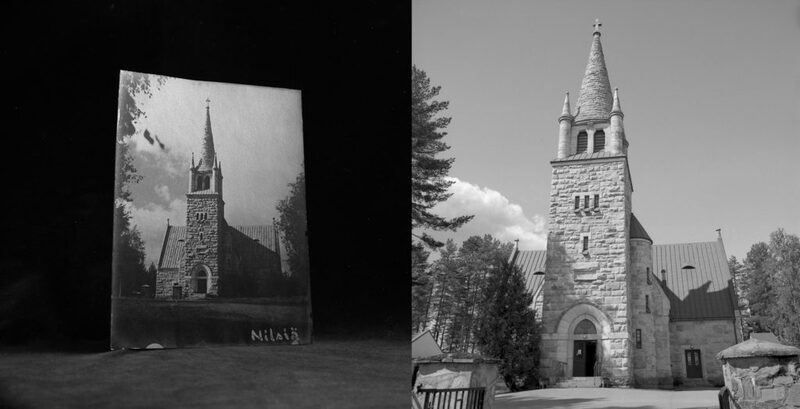 I was able to finally visit the church in Nilsia, of which I have a photo from my grandmother’s belongings. I used to stare at that photo as a little girl, wondering where that stone church was and if it had any particular meaning for my grandmother. Sari also arranged for a summer cottage by a lake, equipped with a sauna. She said I would need to learn how to take a “proper sauna.” This included jumping into the cold lake, and of course, I was more than willing to be initiated into this particular tradition. It was one of the few things my grandmother did talk to me about as a child. 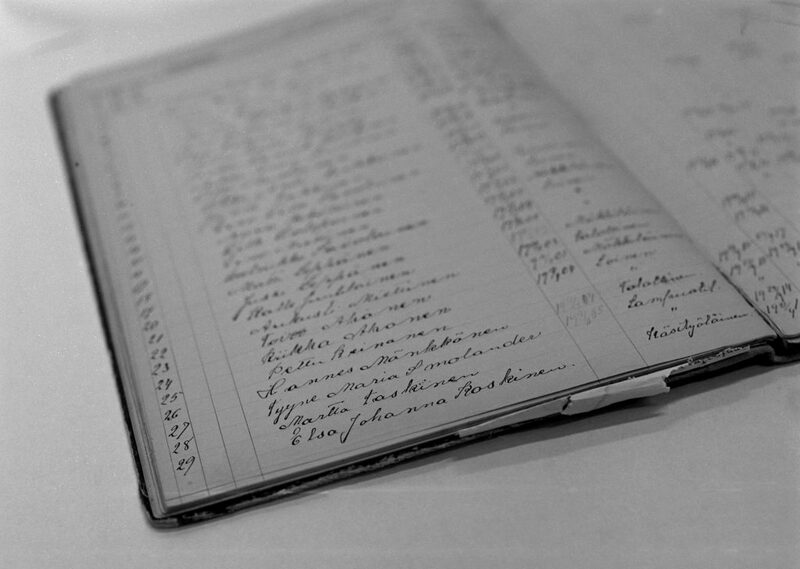 Sari was also able to gain permission for us to access the archival records in both Tuusniemi and Joensu. I traveled with my Hasselblad camera and shot twenty-five rolls of 120 film (fifteen rolls of Ilford Delta 100 and ten rolls of Kodak Portra 160.) 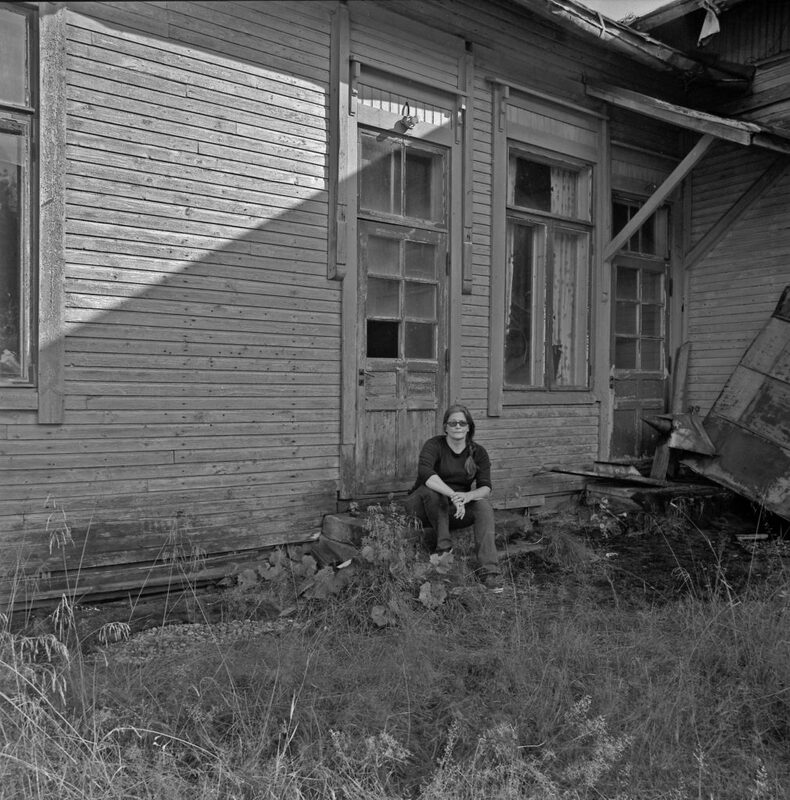 I have since developed the Ilford film and printed images in the darkroom on Ilford fiber-based paper. I personally scanned all the color negatives and printed selected images on Harman archival paper. I am currently working on a series of diptychs. In the five weeks, I was in Finland, I spent a great amount of time in Savonia, where my grandmother was originally from. 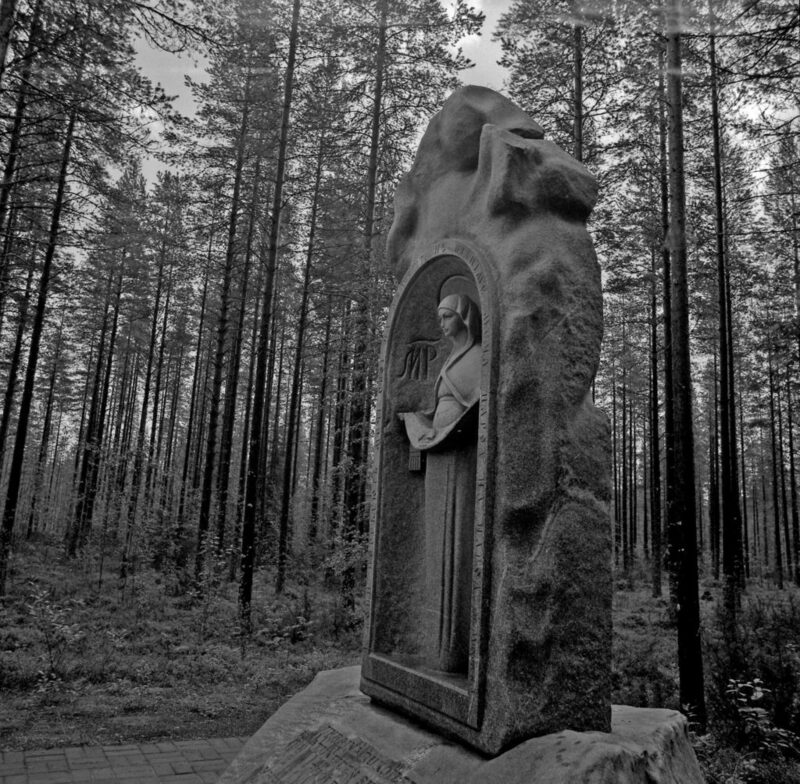 I also traveled to Lapland and the Karelian Russian border where the Winter War took place. I wanted to learn as much as I could about my grandmother’s country. I found the Finnish people to be extremely polite and helpful. I was surprised as to how straightforward they were, not putting on airs or participating in much small talk. I appreciate that – and to be perfectly frank – there was a sense that these were my people. I felt like I was at home and I could just be myself, and for that, I was truly grateful. Family members were welcoming and very hospitable. I ate pulla and Karelian pie, and I found out what a real potato tastes like. 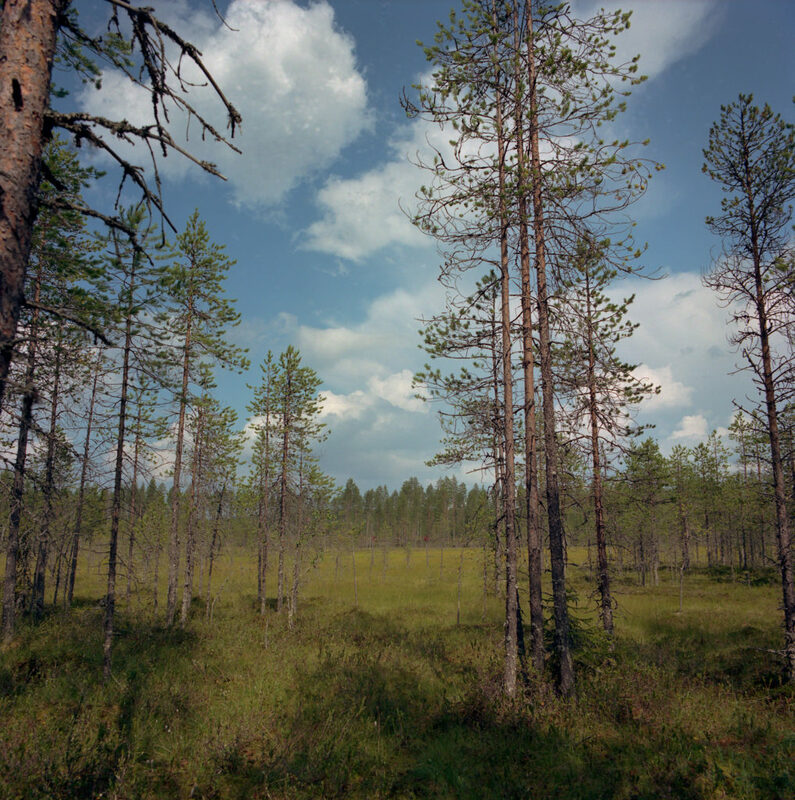 We went berry and mushroom picking in forests throughout Finland, as the people can wander the woods without question or reprimand as long as there is respect. I had some difficulty with the Finnish language, but did master some phrases and started catching on pretty quickly. The Finnish countryside is like nothing I had ever experienced. The light is pure and glorious. How difficult it must have been for my grandmother, at the young age of 18, to drift away from this light. She did not know if she would ever return. She had only an aching hope for a better life. I picture her sitting in her tiny New York City apartment, the skyscrapers surrounding her like a concrete forest. How did she even breathe? I felt closer to my grandmother in Finland than I ever had while she was alive. Among the many things I learned in the short time I was in Finland, was that Elsa had a heartbreaking childhood. 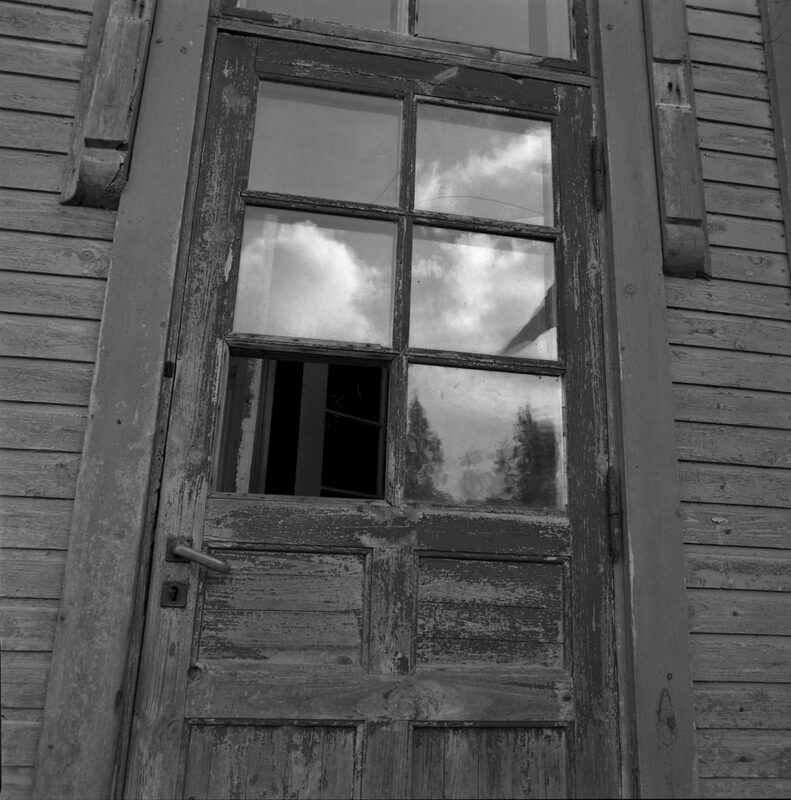 As stated in the Joensu archives, young Elsa lived with her family, “as parasites” in the backrooms of several farmhouses in Ohtaanmäki Village. When Elsa was nine, both of her parents died, one-day apart from tuberculosis. She was then “auctioned” off as a servant in the newspaper along with her older sister Aina. There was a meager stipend from the government offered to whoever could take them in. Aina’s family spoke briefly of how horrible that experience was for the sisters. Although there were stories of death, struggle, and poverty, I also discovered Elsa was a bit of a rebel, a new-age thinker, and a feminist before her time. Most of all, she was a risk-taker and held a great faith that she would be led to a better life. And she was. There were many stories of how Elsa sent packages from America to her family in Finland. She never forgot them. This project is more complex than I imagined. It has many layers, of which I need to explore and honor. I plan on returning to Finland this year. Elsa’s surviving niece, Kerttu is 90 and in ill health. I was only able to meet with her once. I feel the need to see her again. She spoke of Elsa and we discussed the mystery of my grandfather. She even said she knew who he was. Five weeks was barely enough to scratch the surface of such a complex life. 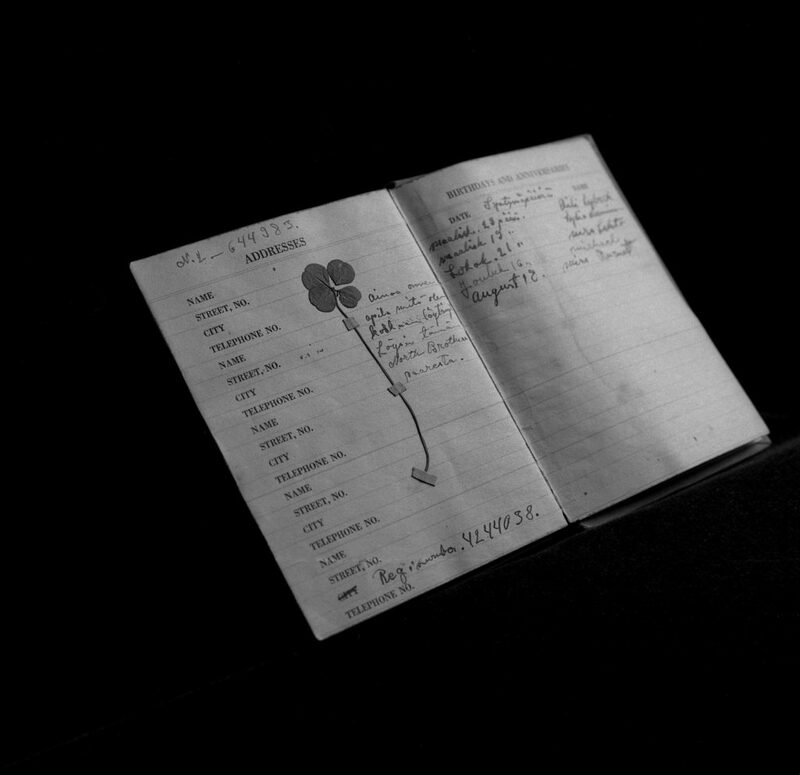 How does one even make a visual “portrait” of someone who is gone, when all that remains are a few belongings and a diary written in a foreign language? Sari has graciously offered to translate Elsa’s diary, and it is almost complete. It will most certainly be an additional compelling visual record. The Mylio Grant helped launch Elsa Johanna into gear, and I am forever grateful for that. So many fine folks in Finland have helped as well, including Pirjo Mononen, who wrote an in-depth article for two local newspapers while I was in Finland. 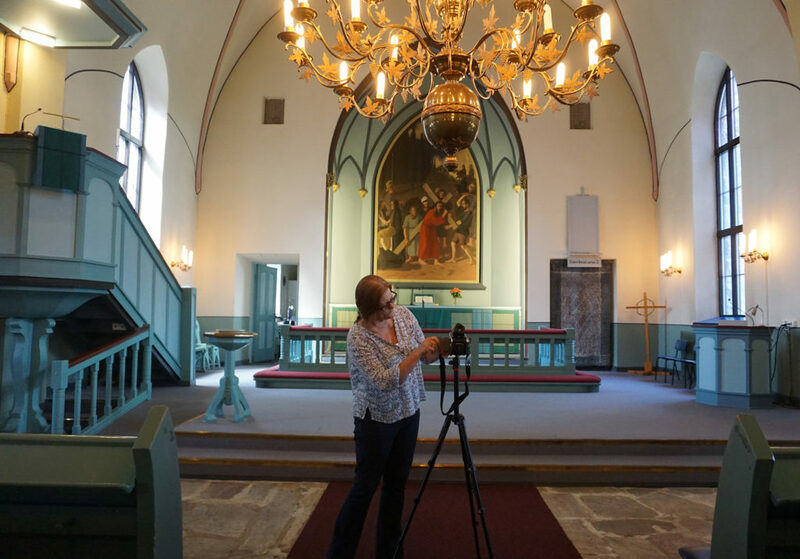 Thanks also to Minna-Liisa Mäkiranta, Senior Research Officer at the Provincial Archives of Joensu, and also to Sirkku at the Records Department in Tuusniemi Church Village. I will be attending the Portfolio Reviews at Photolucida in Portland, Oregon at the end of April and will be showing prints from Elsa Johanna for the first time. 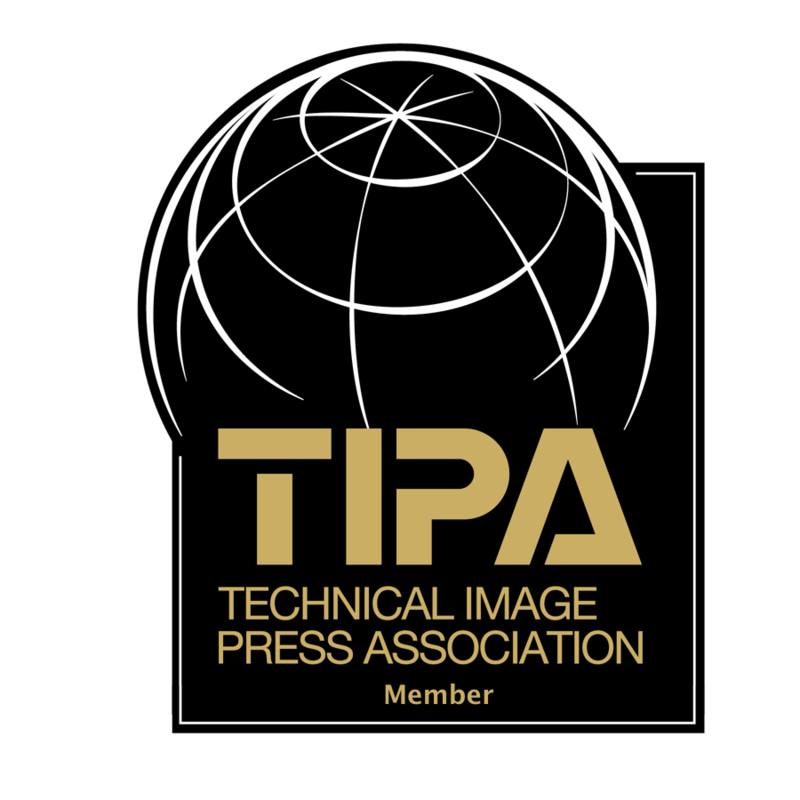 It is my hope to receive professional feedback, as well as possible exhibition and publication opportunities. 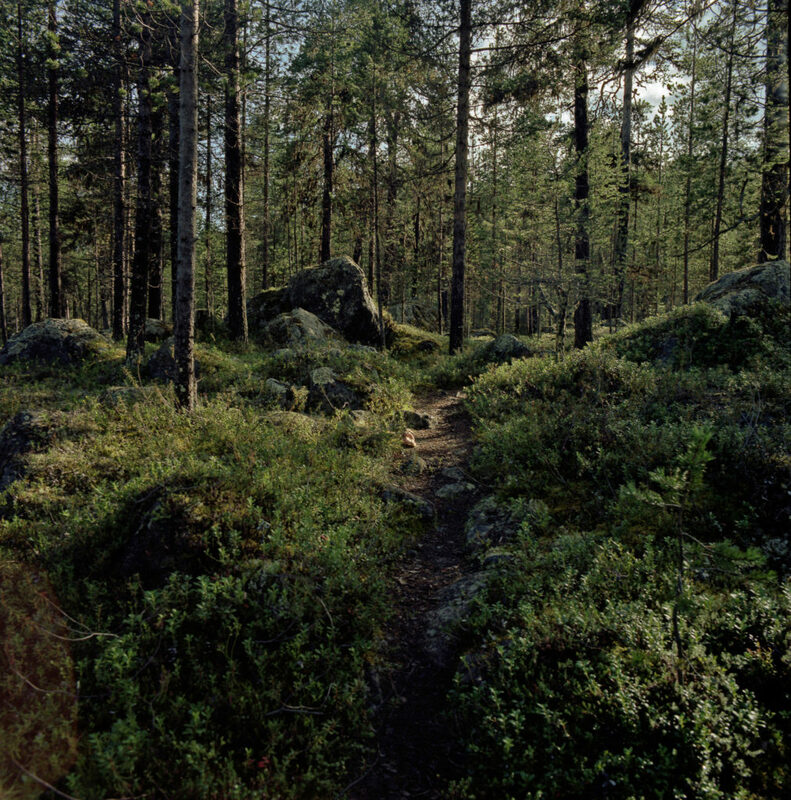 I have also applied for additional grants and several future residencies in Finland. I was recently informed that I have been awarded a SÍM residency through The Association of Icelandic Visual Artists and will be in Reykjavik in September this year (2017). I am grateful that I went forward with this endeavor. Elsa Johanna is an ongoing project of which I now have a powerful and substantial body of work. The subject of immigration has, and will continue to be, a matter of great relevance in today’s global community. The extraordinary life of Elsa Johanna is much more than a single woman’s journey. It’s symbolic of a more universal struggle to be free from suffering, to forge ahead in hope of a better life.